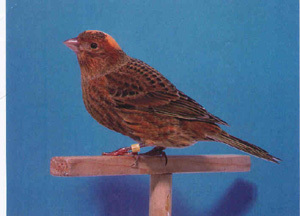 is the one of the oldest breeds of canary still available today. 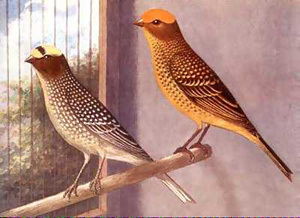 This unique canary bird made it's way to Britain via French Huguenot weavers. These weavers were French Calvinist refugees fleeing religious persecution. ...they almost became extinct in the early 1900's! With the ravages of two world wars and disease epidemics the Lizard was reduced to only a couple dozen breeding pairs by the mid 1940's. The Lizard Canary Association of Great Britain came to this bird's rescue and began a very closely monitored "come-back" breeding program focusing intently on excellent canary care and keeping each bird as healthy as possible. Today this canary thrives and is one of most popular Type canaries available even if his singing is not among the best. Black crescent-shaped spots running down the back and breast of the Lizard give this bird a reptilian scaly appearance. This visual effect is known as "spangling" on the back and "rowing" on the breast. This canary gradually loses this lizard-like pattern with each annual molt. As a result, this striking canary only has one year to do well at canary shows. They also sport a "cap"...a single circular pattern of feathers on top of the head. Sometimes this cap is a regular oval shape with clear edges and sometimes it a rather irregular shaped circle. This is not a cap like the crested canaries have but a simple "cap of color". Legs and beak should be a shiny black. Canary Tips! --Read what some have to say...Click here. Sign up now and you'll also receive the Canary Care Strategies eCourse. It's all FREE. For more on these canaries visit the Southern Lizard Canary Club. Have Something To Share About Canary Types?